I recently started a new company/from scratch setup, with the current version of MD, running on OSX 10.13.1 High Sierra, Macbook Air 2013. 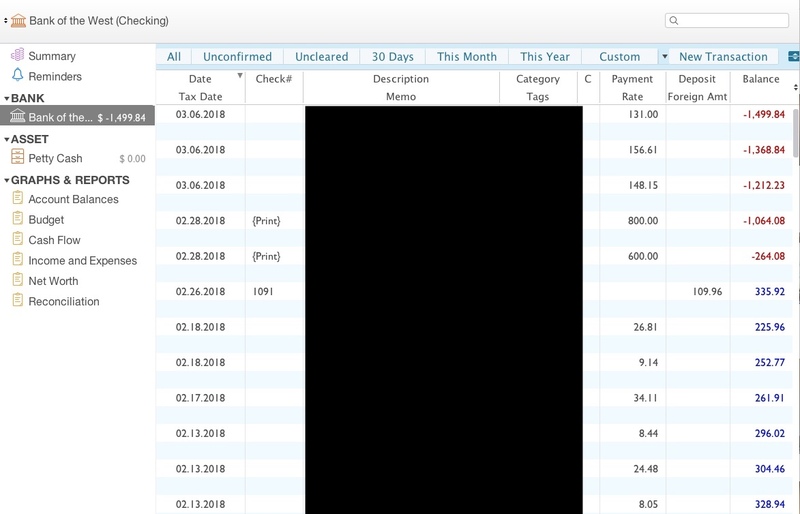 I have noticed that when I quit and then re-open the application, money dance will set me back a couple weeks in my transactions...aka, it will be like all of my recent transactions are gone...AND, the balance also is from weeks ago. This has happened at least 10 times now, over the course of a few weeks...with reboots, etc, etc. Then, if I sit tight for 5 minutes or so, randomly, transactions start propagating (not at the same time), and I see my ledger fill up like a waterfall...it is really weird...not all at once, but one transaction, and then another, and then another. Ironically, as transactions fill up my checking ledger, the balance doesn't adjust. wtf? Then, with patience, suddenly, I AM back to recent. Once all of the transactions "Load", the balance adjusts to the accurate number. MD is getting really confused and loading data from my dropbox backup/cloud sync. Sadly, this is very concerning for me. In the past, I ran a file that had thousands of transactions and at least 10 accounts tied to it. I NEVER experienced this flaw...and yes, I had dropbox syncing to the "app" on my iphone. So, nothing has changed here except that I've actually lightened MD's load, as all it is having to deal with right now is about 50 transactions TOTAL. 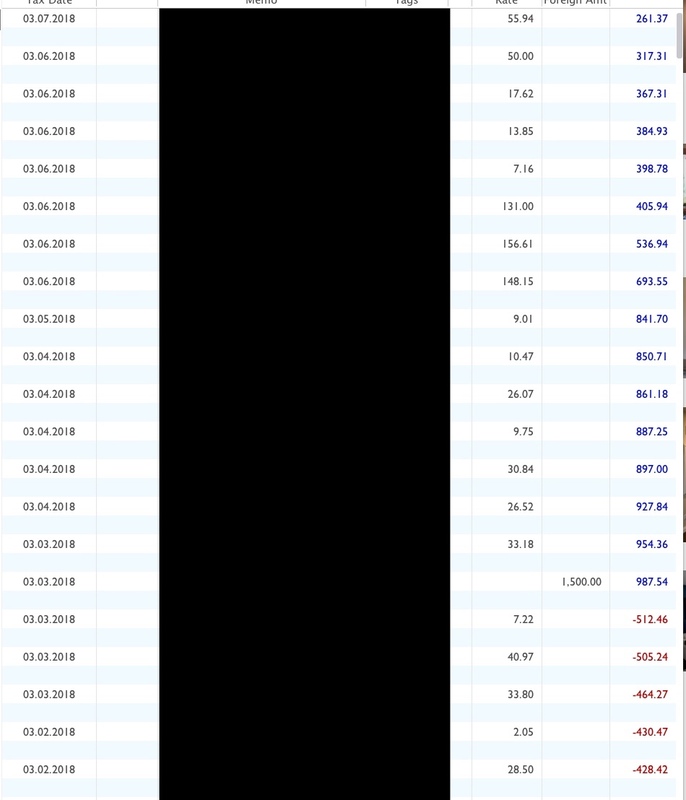 The reason I'm really concerned is that once I really start accumulating months worth of transactions, I have no faith that MD will be able to "catch" up to current if I quit and restart. If it does, it will surely take hours and that will not work for me. Please help me fix this so that I don't move to another platform...MD is amazing, but not worth the recent hicups I've been experiencing. I figure I have patience for about 1 more month of trouble shooting before I'm gone. I want to open MD, enter my receipts, and go about my life. I noticed that there are still no replies to this thread. Unfortunately I'm still having the same problem. I am running Max OSX 10.13.1 High Sierra. Perhaps I will update my OS, and see if anything changes. I am running MD 2017.5 (1639) These are running on a Macbook Air 2013. Please accept my sincere apologies for the delay getting back to you. I’m afraid that your request for assistance was missed by the support team, and it’s only now we’ve been able to work through the backlog of older discussions. and please let us know if the issue repeats. @Robert I'm very sorry about the issue you are facing, I have answered your previous discussion, would it be possible for us to continue with troubleshooting in that discussion? I have also removed your number from this public discussion as it is visible to everyone. Thanks for the quick reply. Good news, as of now, the update to 2017.6 fixed the issue. I will post more if things change. Thank you for letting us know, I'm glad to see that everything works. I'm afraid the solutions from above have not fixed the issue. This evening I went to log a few transactions, and the ledger was set back weeks, and nothing was changing as I waited. I quit MD, and restarted. Slowly...like every 20 or 30 seconds a previously entered transaction would randomly propogate and slowly update the ledger balance and ledger to the current date. This took about 10 minutes. At this point the numbers match, and my last transaction from yesterday is present. I did NOTHING. Nothing to cause the setback, and nothing to fix it beyond freaking out and waiting for ten minutes. My iphone is synced with MD through dropbox. This was never an issue until I started this thread in November. I'm sorry, but I should not have to wait 10 minutes to enter a transaction and have my balance current. This is very strange and would love to see it fixed. 1) As showcased when I clicked on MD to enter a transaction. 2) several minutes later with no action on my part. 3) finally caught up to todays date. Hints: I had wifi/internet off for about 12 hours this afternoon. Could the program automatically undo all of my work in the background when wifi is turned off, defaulting to an old local automatic backup or something?? ?....and then, when I turn wifi (internet) back on, perhaps it realizes it is retarded and syncs with the current drop box backup which is probably most recent? I'm very sorry to see that you experienced this type of shock. I can confirm that this replay does appear as a syncing issue. 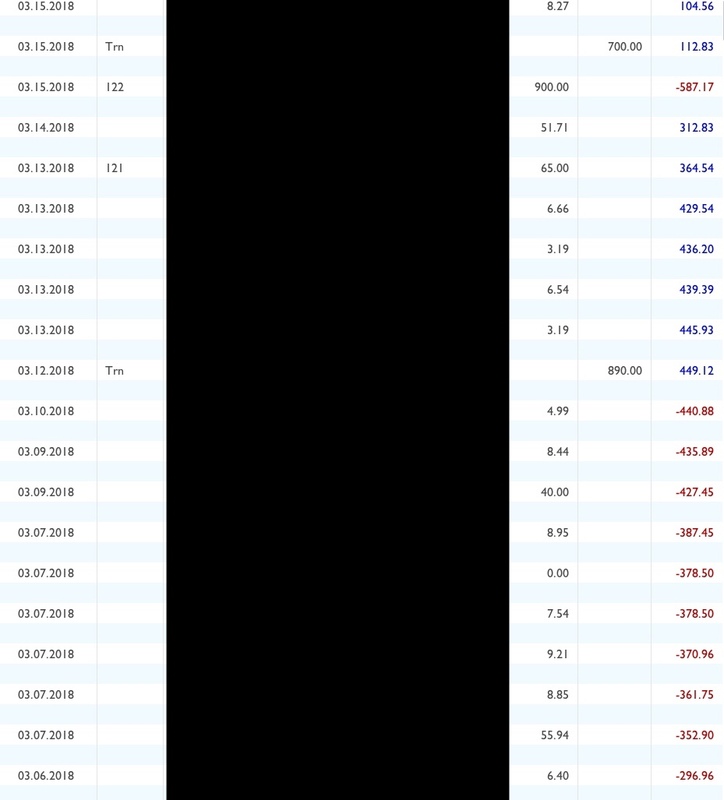 Were you most recent entries entered on Moneydance on your computer or were you using your secondary devices for most entries in the last week? If the case is that you haven't used Moneydance on the computer, then this would explain why you were set back in your register. The time it took to update to the most recent state however does seem very long. The log will display any recent errors which may have caused the delay. I'm attaching the errlog file. I don't think the sync issue is related to syncing with transactions entered on my ios MD, as 90% of my transactions are entered at home on my OSX macbook air. The few that I do enter on my ios MD app, I do expect a delay when opening the OSX app. Whatever is going on here is different, but maybe related. Thank you for the logs, the log confirm an issue with syncing. Open Moneydance and go to Extensions in the menu bar, then 'Manage Extensions' and find the Network synchronizer extension and remove it, then restart Moneydance. First disable Dropbox syncing in Moneydance via File --> Syncing, then close Moneydance. Using the Dropbox app or website interface, delete the .moneydancesync folder in your Dropbox folder. Then re-open Moneydance and re-enable Dropbox syncing via File --> Syncing. 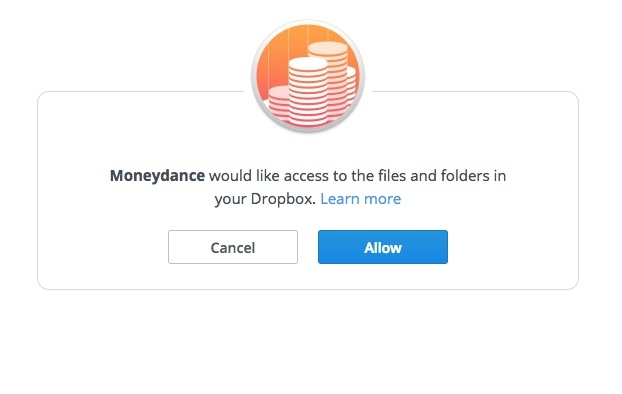 Sign out of Dropbox syncing on the Moneydance app on your mobile device and reconnect. If you have any un-synced transactions on your mobile devices then this process will delete any transactions not stored in the main data set. You'll want to manually enter any transactions like this before following the steps. Thank you. However, I do not have the options of removing or installing the Network Synchronizer extension, as it is not listed. 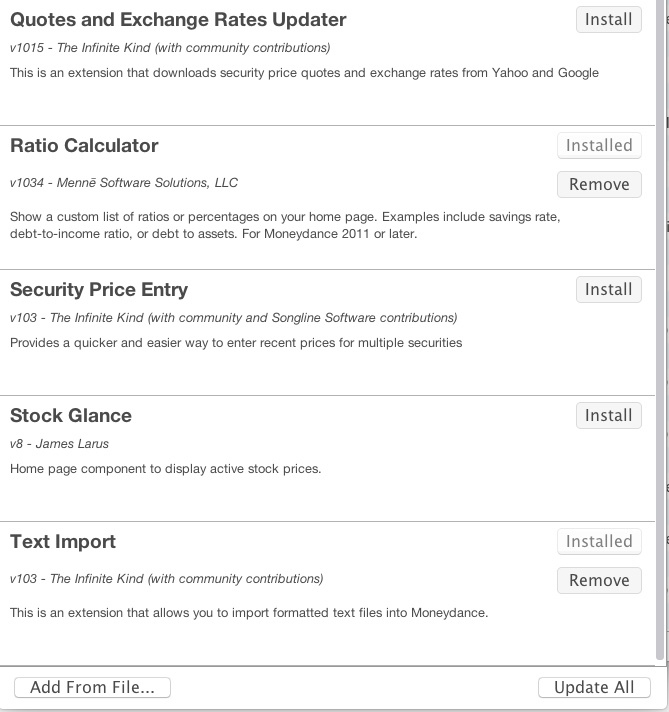 See attached screen shots of available extensions. I ended up going to File>Syncing...> and disabled my existing dropbox "connection", not folder. I then quit MD. Upon restarting, it set me back a couple days based on ios added transactions (aka undid them). Then, I re-setup dropbox "connections" (not folder), and followed the steps for validation. Once complete, those lost transactions re-synced with the OSX MD, and I was back to normal, assumingly synced with the dropbox connection prior to this process. I am skeptical this will change things. Maybe I should look into syncing through one of the other methods? Thank you for checking, it is however a bit strange as the log that you sent me earlier showed the Network Synchronizer as being installed. Would it be possible for you to send me a new errlog.txt, I'm wondering if it will still display the extension? When connected to the internet constantly, the Dropbox Connection option should connect to the .moneydancesync folder online, which always has the most up-to-date data, while using the Dropbox Folder option, Moneydance first connects to the Dropbox Folder on your computer and reproduces the state on the folder and if the folder hasn't updated yet then you may see older transaction data until that is updated. Henry I seem to remember some time ago support asking another user who had a problem relating to a extension to list the mxt files they found in there fmodules folder? You're right Derek, thanks to you I found a very similar case to this one, where the Network Synchronizer was present in the fmodules folder. 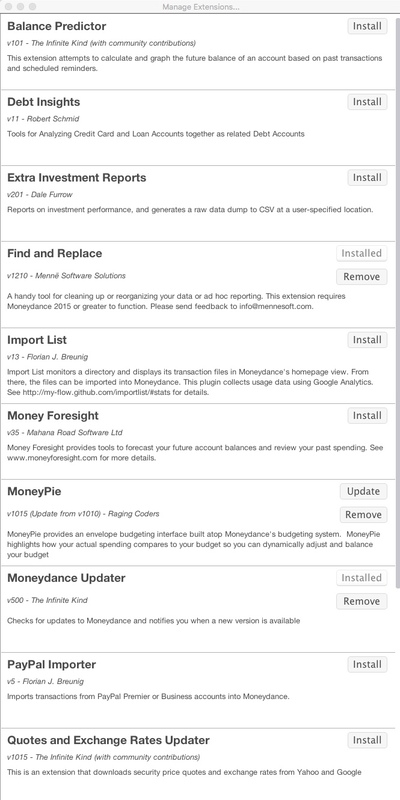 If someone previously had an older version of Moneydance then they could have this extension installed, if they then upgraded Moneydance to 2015 or latter the extension would still be present unless they deliberately deleted it prior to the upgrade and because the extension is not available in the latter 2015 extension list it would not show in the Manage Extensions listing. Hence it becomes something of an orphan with no apparent way of deinstalling it. You can delete it from the fmodules directory so it cannot load, but that leaves an error in the log whenever you start Moneydance that it cannot find the extension, and I hate errors like that. The only remedy is to edit the config.dict file by hand. This is not something I would recommend for the average user however as that file is not designed to be edited. So there is no way in Moneydance to really clean up a problem like this. System closed this discussion on 21 Jun, 2018 09:50 PM. Can someone address dwg's comments? I have not had the time or technical prowess at the moment to try those suggested remedies beyond my last thread response. I have recently updated to the current 2019.1 (1855), but I have not checked to see if extensions are working properly. That said, I'm ready to dial in MD and finally make it work for me, and moving forward I am concerned about the way updates seem to create issues (I always update...for years at this point). Perhaps when I update I should export and backup my company, and then completely delete MD, and then completely reinstall a new download, and then import my backup to address these issues? The accepted way in Moneydance of fixing up the issue of orphaned extensions is to rename or delete your config.dict file and then let Moneydance create a new one, reentering your license key etc. This is the Q&ER extension BTW. It is not an elegant solution and there should be another way but it works, and if it doesn't go right you can restore the file you saved of create a new one. As far as updates go you should always take a backup prior to upgrading you copy of Moneydance. I do not care if you delete and then reinstall Moneydance or not, although given the problems some users seem to have with updating applications on the Mac platform and ending up with multiple versions it may not be a bad idea to uninstall first on the platform. Uninstalling Moneydance does NOT affect the data, the software and data are independent. So installing Moneydance and running it should open your existing data and perform any required changes. You have the backup should there be a problem.